The webinars are very informative. I have been using this web site for a long time. Individual courses & CE bundles starting at less than $1 per CEU. Read the material, pass the test and pay. Instantly print your certificate. FMES LIVE! credits. Watch from any computer, smartphone, or tablet with internet access from your home or office. Many of our programs are available in paper format by mail order. Not signed up? Create an FMES account here and enjoy features like webinars and articles! We are here to help you stay in compliance. Florida Medical Educational Services (FMES) is a Florida-based company, offering approved continuing education credits. FMES will instantly report your continuing education credits to CEBroker, if you provide a Florida license number. FMES offers online discount course bundles for Florida nurses, Florida respiratory therapists and certified nursing assistants. No need to pre-pay. Register, read the study material, pass the test, then pay. 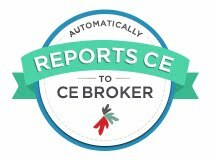 Instant certificate, instant reporting to CEBroker. Now you are "renewal ready" with the appropriate Florida Board. Register now and get your Florida license "renewal ready". We offer discount CEU packages starting at $24.95. Course bundles available for nurses, respiratory therapists, and CNA's. We offer the traditional courses as online home study. These credits can be completed instantly online or as mail order booklets. FMES also offers LIVE webinar credits. No matter which format you choose, FMES will report your credits to CEBroker. Florida Medical Educational Services has been assisting thousands of licensed medical workers to stay in compliance with the State of Florida regulations. FMES is an approved provider by the Florida Board of Nursing, Florida Board of Respiratory Care and approved for Florida Dietitians and Nutrition Counselors and others. Check our accreditation to see more. We offer the mandatory Prevention of Medical Errors, Domestic Violence, Recognizing Sustance Abuse, Human Trafficking and Laws and Rules for Florida RNs and Respiratory Therapists. FMES also offers an approved HIV/AIDS course for barbers and initial cosmetologists. Our HIV/AIDS courses are approved by several Florida Boards and Councils. We think you will be pleased with our customer service and educational content. Read more about us. Register now and Get Started. Try FMES.net by earning one free credit! FMES would like to invite you to try our service for FREE. Register and complete any one hour online home study course then, enter the code "free" in the check-out process to earn a one-time, one free FMES credit valued at $7.00. Want to try a FMES LIVE! Webinar? You can use the $7.00 credit toward any FMES LIVE! Webinar ($10) by entering the word "free" during the check out process. Your net cost for the FMES LIVE! Webinar will be $3.00 after the credit is applied. If you originate from the FSRC website this discount code will not apply.